For me, nothing says “end of summer, beginning of school” more than the buzzing drone of the cicada (which means buzzer in Latin), a large (2-5 cm., up to 15 cm in the tropics) insect that spends most of its life (usually 2-5 years; up to 17 in some species) underground (up to 2.5 m deep! 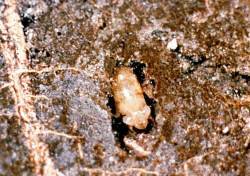 ), busily sucking on plant roots. 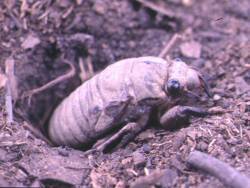 Eventually, the nymph emerges, crawls up onto a trunk or branch, and moults (video!). As an adult, its prime function is reproduction, with the males only doing the buzzing to attract females by vibrating its tymbals, complex membranes on either side of its abdomen. These timbals are also used to hear with. Fortunately, the males disable this hearing function before calling – otherwise, they’d probably go deaf! 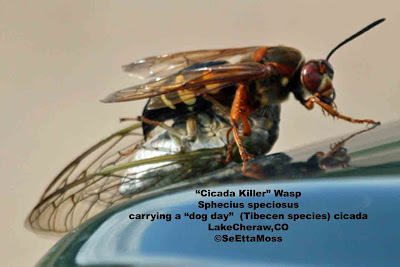 All this activity in turn exposes cicadas to predators, including the Cicada Killer Wasp, which paralyzes the cicada in order to feed its developing young. After mating, cicada females lay eggs in twigs. After hatching, newborn nymphs drop to the ground, dig in, and the cycle begins again. Cicada calls can be found here. Other insects commonly heard this time of year include crickets, katydids and grasshoppers. Species most commonly heard in late summer include the Fall Field Cricket, Carolina Ground Cricket, Bush Katydid, and Marsh Grasshopper. The males stridulate, which means that, unlike cicadas, they rub body parts together (crickets use their wings) to create their call. Successful (well-fed) male crickets literally wear themselves out calling, dying sooner (but presumably more satisfied) than less successful males, which call less and later in life. Here are resources for crickets in the classroom. Another sure sign of the return to school are Red Maple samaras that helicopter to the ground, providing entertainment on the walks to school. Blue Jay calls are common sounds. Some Blue Jays move south, while others will stay. With the change of season, many birds are on the move to Central and South America. To get an idea of the volume of bird migration, stand outside on a calm, clear night and you’ll hear the contact calls of thousands of migrating songbirds – particularly thrushes and warblers. Migrating Common Nighthawks are most visible during the last three hours of daylight. They migrate in groups, sometimes quite high, and all moving in a southwesterly direction. Red-winged Blackbirds are massing prior to migration. Check your local marsh! American Pipits show up in recently ploughed fields. Some butterflies are migratory, too. 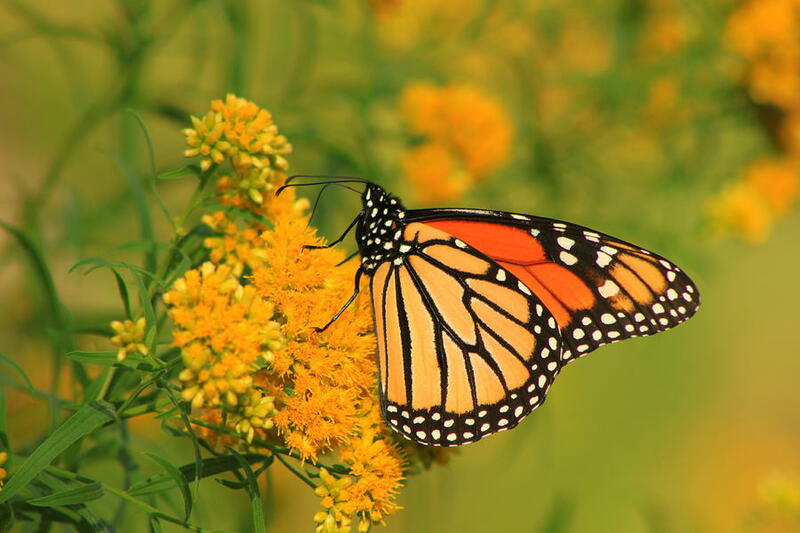 In the early morning and evening, migrating Monarch Butterflies can be found clustering in trees and shrubs along shorelines, on their way to their wintering areas in Mexico. You can view their fall migration over time on the Journey North website , where there are tons of information, activities and lessons about Monarchs sign up to become part of this incredible journey. You can see the isolated mountaintops where they will over winter and the incredible profusion of resting butterflies. We’ll keep tabs on this bit of Canadian biodiversity while the snow flies, and then get ready for the journey back north in the Spring. As a preview, watch this Monarch caterpillar hatch from its egg. Clouded and Orange Sulphur viewing is good in September. Shorebird migration is well underway by the time the school buses begin to roll. One such traveler is the Semipalmated Sandpiper (Calidris pusilla). 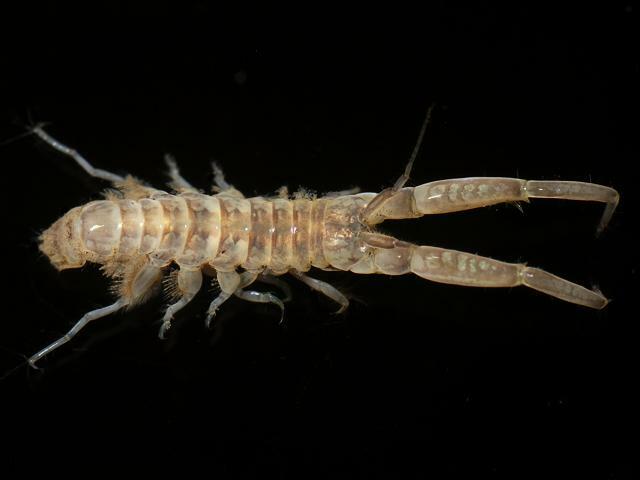 In Atlantic Canada, early September marks the departure of the last of these arctic nesters who have been gathering on the shores of the upper Bay of Fundy in August to fatten up before moving on to their winter destinations in South America. What is truly amazing about this final leg of the journey is that it must be completed non-stop and requires the little bird to sustain its flight for up to 96 hours. The sandpipers are drawn in large numbers to the mudflats of the Bay of Fundy due to an abundance of one particular species of shrimp-like amphipod (Corophium volutator)that they rely on for energy. This annual stopover attracts naturalists and birdwatchers from around the world. Check it out. The Giant Swallowtail is Canada’s largest butterfly. It appears to be moving eastward from out of its their Southwestern Ontario ‘home’ to become more noticeable in Southcentral and Southeastern Ontario, all the way to Ottawa and parts of Quebec. And at a wingspan of up to 15 cm, they do get noticed!. 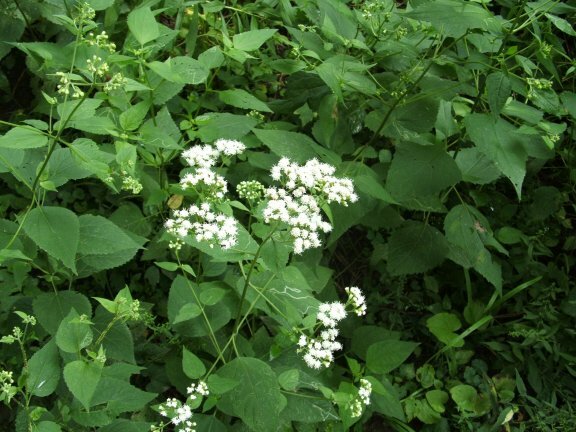 They may eventually reach the geographic limit of their food, the Prickly Ash and Common Hoptree. 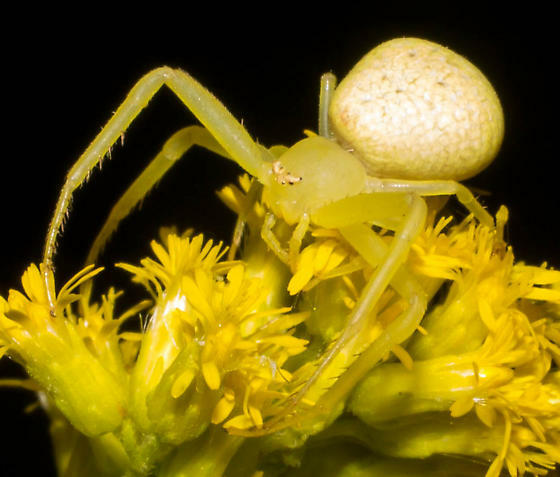 Taken together with the northern expansion of many other southern species, they may be a harbinger of additional changes related to global warming. And they may still be flying around your area, so keep an eye out! 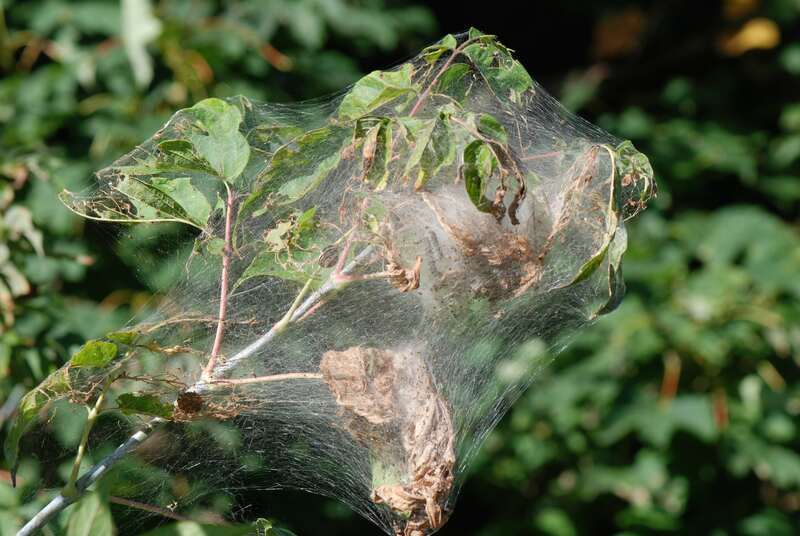 Fall Webworm nests are noticeable on shrubs and broad-leaved trees. They will over-winter as pupae. False Dragonhead, Fringed-topped Bottle Gentian, Brook Lobelia, and White Snakeroot bloom. Beavers get busy cutting trees for their winter food supply. Look for loose piles of branches near their lodge. Eastern Chipmunks, Eastern Grey Squirrels, and Red Squirrels are also busy storing food for the winter. Goldenrod are now in full bloom and will continue to the first frost in early October. It is worth a trip to look at these every few days. They can be found in some schoolyard naturalization sites, most old fields or the manicured edges of parks. Goldenrod attract many insects which make observing them so interesting. These include Monarchs, bees and spiders. The children’s picture book On One Flower is a great resource to use before or after a goldenrod field trip. 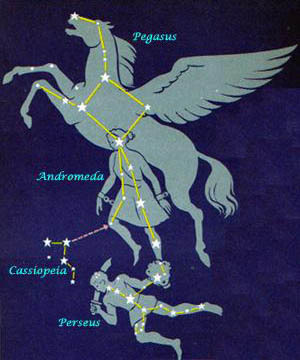 Pegasus, the flying horse, is a well-known fall constellation in the southeast sky. The Great Square, which makes up the body of Pegasus, is the most obvious part. One of these stars is also shared with Andromeda and can be used in locating the Andromeda galaxy – the most distant object viewable with the human eye. Andromeda is our closest galactic neighbour and is also a spiral galaxy. If you are able to make it out, you are seeing the past. The light that you see actually left the galaxy two million years ago! Stellarium is a great, free program for introducing and teaching the night sky in the classroom. Beginning early in September, both Venus and Jupiter will be visible to the west after sunset. The earth is closest to Neptune during 2018 on the 6th, but it’s hard to find. Five times fainter than the dimmest star you can see, you will need at least a good pair of binoculars and a star chart.